A 10mbit connection with Regus (the serviced offices I’m in) costs more than 3000GBP a month! 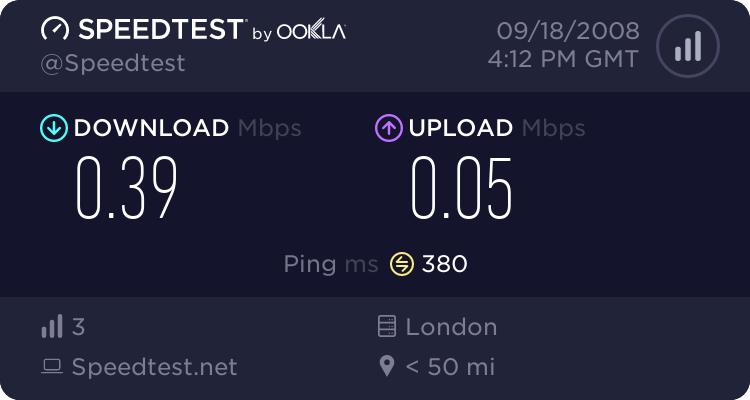 I used to think 29GBP for 20mbit with Virgin Media was a rip-off. Regus serviced offices are to be avoided like the plague. Now I am seriously looking into mobile broadband. Getting any Internet at all at first from my mobile with my laptop was amazing. Now I am looking at the results and they aren’t good. 30kB/sec downstream on Hutchinson 3G UK in ideal conditions is incredibly poor. The Iphone has HSPDA enabled, but you can’t share that with your laptop. You see as I’ve said before carriers don’t want you using your “unlimited” Internet enabled mobile with a device like your laptop. Will new Android devices save the day? The HTC Dream only has 3.6Mbps HSDPA. So half of what a 3G networks like Vodafone’s currently boast. So any tips, other than moving back to Korea and I would be grateful.